Shopping in Istanbul is often a big part of any visit, and the city's famous historical bazaars offer a wonderful insight into city life. Whether shopping for carpets, spices, vegetables or clothes, the process of making your purchase is likely to be enhanced by the atmosphere of wandering through the crowded stalls - and of course haggling. As usual when bargaining with persuasive shop owners, have an idea of a good price before you start. 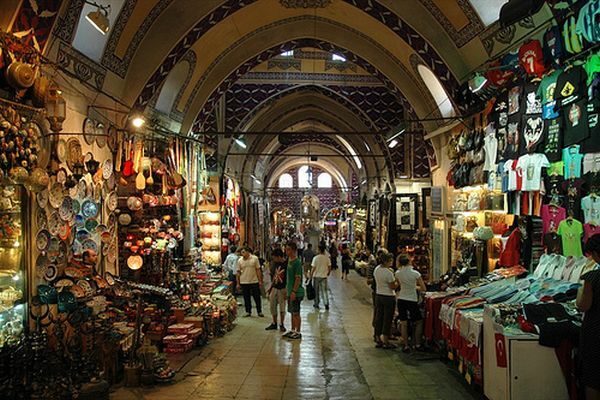 It is the oldest and biggest closed bazaar in the world, also known as the Grand Bazaar, has around 4000 shops and over 60 alleyway, covering a huge labyrinth in the city centre. The original two structures, covered with a series of domes and remains of the 15th century walls, became a shopping area by covering the surrounding streets and adding to it over the following centuries. In Ottoman times this was the centre of trading, and a vital area of town. The Sandal Bedesten was added during Suleyman's reign, to cope with the rising trade in fabrics, during the 16th century. Traditionally the more valuable goods were in the old central area, called Ic Bedesten, because it was more secure. As quite typical of the area, most streets are laid out and devoted to a particular trade, for example gold on Kuyumcular Caddesi, leather on Bodrum Han, and shoes on Kavaflar Sokak. But the trade has also spilled out onto the surrounding streets, and it is very common to see Russian traders buying up huge sacks of leather jackets or shoes outside the main entrance. Even the streets leading to the Golden Horn are lined with outdoor stalls, which have traditionally been controlled by strict trading laws to reduce competition between traders. Apart from the usual shops selling clothes, textiles, jewellry and carpets, there are small workshops, where craftsmen cast and beat silver or brass, in a skilled trade handed down through the generations. If all that shopping, bargaining and fending off persuasive salesmen is a little too tiring, there are also traditional cafes dotted inside the bazaar in which to relax, eat and sip tea. There are also money-changing booths inside and out. It is slightly less crowded during weekdays, as most locals shop at weekends. Also known as the Spice Market, this is Istanbul's second bazaar, constructed in the same complex as Yeni Camii (or New Mosque). There are six gates, which make it an attractive exterior. The L-shaped market, together with the mosque, were built for the mother of Mehmet IV, a powerful woman who ruled the harem and, some would say, much of the empire. Although no longer the prime spice trading area of the city, there is still the aroma of ginger, cardamom, pepper and saffron from the piles of spices sold from many stalls. These days it is also popular for great varieties of lokum (turkish delight), small souvenirs, flavoured teas and local delicacies – including the dubious sounding "Turkish Viagra". Locals come here to shop for bed linen and towels, as well as for fruit and vegetables, coffee, clothes, pots and pans in the surrounding cramped backstreets. Outside the market on the Galata Bridge end, is this is the best place to choose olives from huge barrels, and many varieties of beyaz penir (white cheese). Bazaar Lesser known and smaller, but nonetheless just as interesting is this market in Beyazit, under the north and east walls of Istanbul University. Copper is beaten and produced into many shapes, sizes and forms, and shops sell cauldrons, saucepans, buckets, candlesticks and the like. Away from the classical, historical markets which have always attracted by the tourists, there are many flea and street markets around the city, usually consisting of streets of junk shops. As usual, getting a real quality bargain is often down to luck, but it is still an interesting way to shop. Cukurcuma Sokak is the central point of streets of shops selling old wooden furniture, antiques, and books, near the Galatasaray Hamam off Istiklal Caddesi. Uskudar's Bit Pazari is on Buyuk Hama Sokak, and in Kadikoy, Ozelli Sokak sells mainly furniture. 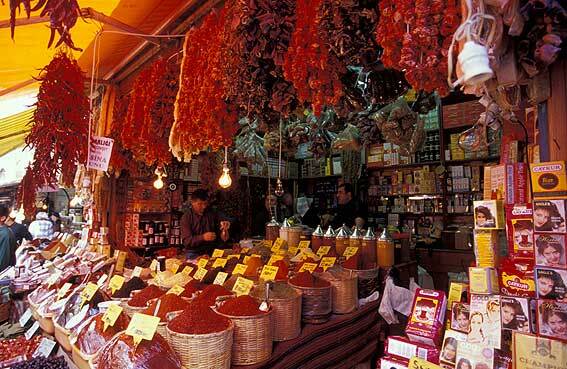 Horhor market, behind Aksaray mosque, is famous for antiques, selling rare Ottoman furniture. The Entel, or Intellectual Market in Ortakoy sells arts, craft and antiques, music cassettes and books, and is open every Sunday and usually very crowded. Besiktas Pazar is open every Sunday, a warren of streets near Sair Nedim Caddesi, sells bargain clothes. Terkoz Cikmaz, next to the Pasabahce glass store off Istiklal Caddesi, has bargain designer clothes, factory seconds or overruns from France, England and Germany at rock-bottom prices. Sahaflar Carsisi is near a flea market, and specialises in second hand books.